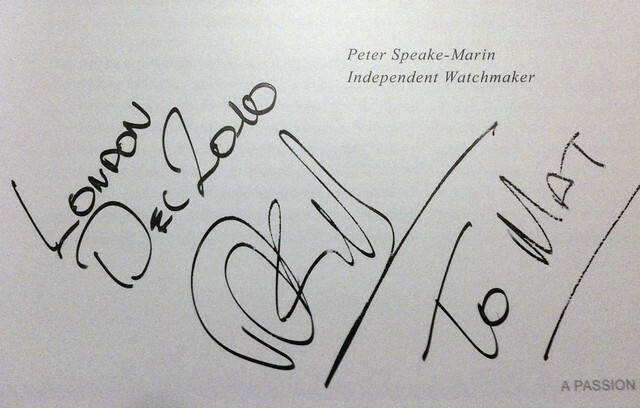 Firstly, a confession: I do not own one of Peter Speake-Marin's watches. 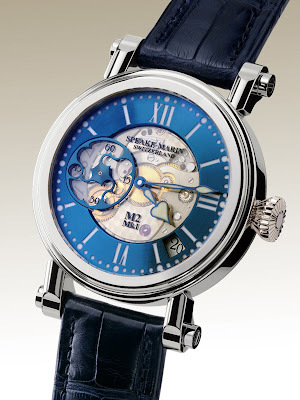 I should dearly like to, and certainly aspire to own one, but at present, my Speake-Marin desires are being vicariously lived though Peter's excellent A Passion for Watchmaking and those watches I see posted on Twitter, forums, etc. To be invited (thanks to the Sydney Tarts) to attend the first ever London PSM GTG was therefore something of an honour. On Friday evening, I rushed out of work just after five, jumped on the tube down to Oxford Circus and walked the five or so minutes to Albermarle Street. I'd not met Peter before - this was his first GTG in London, after all. And given the price of some of his pieces, I wasn't sure whether the room would be full of collectors, watch nerds or something else completely. Turns out the he'd booked the back room of a small Italian restaurant called Dolada. Nice venue. Quiet. Great staff. There were already about ten people there by the time I arrived, including two names I recognised from the ACHI PuristS forum - Greg D and Mo - James Gurney (editor of QPMagazine and organiser of the incredibly successful SalonQP 2010 in London the previous month), a couple of people I recognised from Somlo, including George and his wife, who I'd last met at the Olympia Fine Arts Fair. But no Peter. Greg explained the Peter was approximately four hours behind due to bad weather into Gatwick; I must admit I was incredibly disappointed. I chatted with Mo and Greg for a while, ogled a lovely gold snake calendar Piccadilly (which turned out to be Peter's own watch), and an incredible 1in20 perpetual calendar, while drinking some excellent Prosecco. Greg made a call and confirmed that Peter had taken off and would be jumping in a cab when he arrived at snowy Gatwick. I had another appointment, so said my goodbyes, popped off the Apple store to get a replacement phone. By the time I got back over an hour and a half later, there were only four people left. They'd moved to a table in the centre of the restaurant but there was still no sign of Peter. Greg very kindly asked me to join their table, so I ordered a glass of wine and spent lovely hour chatting about pens, chef's knifes, food, top end audio and Japanese studio ceramics! And then Peter arrived. He was instantly recognisable and wearing the trademark scarf. He looked absolutely frazzled. He'd had a nightmare with Swiss Customs, had been delayed nine hours in total and was pretty much dead on his feet. He grabbed a beer, sat down next to me and whipped off his Thalassa! 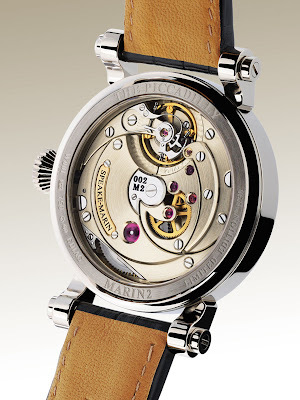 A brief interlude: the Marin-2 Thalassa is the latest watch to be designed and built by Peter. It contains the in-house SM2m manual wind movement, a beautifully blued hand set, framed by a blue outer dial with cut-out roman numerals and the most incredible running seconds, based on Peter's trademark vintage topping tool design. It really is an absolutely lovely piece. The white gold case is weighty, solid but also perfect on the wrist. The German silver bridges, so visible through the cut-out dial, have a warmth to them which is rarely seen in other metals. The movement, visible through the caseback, is a series of off-centre circles, with multiple layers, a highly three-dimensional appearance, and the lovely double swan-neck regulator and trademark large jewel framing the central mechanism. Thank you Peter, for braving the snow, ice and Swiss customs, and thank you for bringing with you the Thalassa. I have a new aspirational piece, that's for sure.